A UPS (Uninterruptible Power Supply) is a battery backup for your electronic devices, such as computers and related equipment. I find that a lot of people don’t know what a UPS is, so I thought I’d do a quick tip about them this week. Since I started my Tech Tips, I’ve covered how to protect your files with a good backup strategy, how to protect your accounts with strong passwords, and how to protect your WordPress web site with proper security. Now you’ll learn how to protect your equipment with a UPS battery backup. The power coming into your house isn’t always a perfect 120 volts. Sometimes it dips too low, and sometimes it spikes too high. This often happens during thunderstorms, but it can happen any time. This can damage electronic equipment that is plugged in at the time. A power strip with a surge protector can help protect equipment, but the next level of protection is a UPS, which ensures your equipment gets a constant supply of power throughout any issues. Power strips can only protect against excess power – they don’t offer any protection from insufficient power. Have you ever been working at your computer when it shut off suddenly due to a momentary power outage? This unexpected shutoff can harm your computer and often causes open files to be corrupted or data to be lost if you haven’t recently saved. A UPS provides constant and consistent power to your connected equipment during any dips in the power coming into your home or office. In the event of a power outage, it seamlessly switches over to battery power. It allows you to keep working during a storm without worrying if the power will go out. And it means you won’t be surprised by a sudden power outage not caused by weather. Many power outages are very short, lasting less than a few minutes. In these cases, if your computer is connected to a UPS, you can keep working seamlessly. After a while, if the power doesn’t come back on, you have time to save your work and gracefully shut down your computer. There are many different brands and sizes of UPS devices. I always recommend APC brand, because they are a leader in UPS devices, so replacement batteries are easy to find. Typically, UPS models are described by the number of VA (Volt-Amps) they can provide. This tells you how much battery power they have, which determines how much power they can provide for how long. In the photo above, you see my UPS is showing minimal load and with an estimated 100 minutes of run time on battery. If you have a single computer and monitor, and you only need it to run on battery for a few minutes, a model with 550VA should be plenty. These models are typically fairly basic and look like a large power strip. If you have a system with multiple monitors or several connected EHDs and other devices, or you want your UPS to power your equipment for a long time, you will want to look at a UPS with more VA, perhaps a 750VA or 1000VA model. Larger models typically look like small towers, and often include LCD displays to display how long your connected devices can stay on, like in the photo above. Because they are very heavy and expensive to ship, you can often find the best prices on UPS devices at a local brick-and-mortar store, such as your local office supply store or Best Buy. Prices range from about $50-$150+ for standard home models. A good price is about be about one-tenth the the VA number. 550VA models are around $50-$65 usually, and 1000VA models are around $89-$130. You will notice that your UPS has some plugs that say “battery backup” and others that say “surge protection only”. 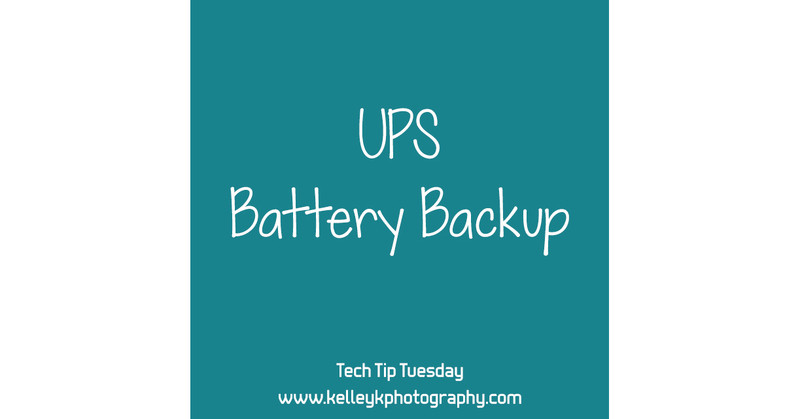 Make sure you plug your computer and any EHDs into the battery backup plugs to get the benefit of the UPS. The other plugs are just like a typical surge protector, and the connected devices will not stay on during a power outage. Some people choose to plug their monitor into the battery backup so they can keep working right through a power outage. Other people choose to get longer battery life by plugging monitors into the surge protection outlets. Note that laser printers should not be plugged into UPS at all, due to their high power draw. They should be plugged into a separate surge protector. Once you get used to having a UPS for your computer, you may find you love the convenience and peace of mind from having your expensive electronics protected from power outages and brownouts. We use a UPS on our computers as well as our good television and home theater equipment, as well as our network gear. It is much easier on the electronic components in these devices when they are fully protected from the ups and downs of your power grid. This should especially be a consideration if you live in an area that is prone to electrical issues, such as rural areas or regions where brownouts or lightning storms are common.